Sorry. Real busy in the office, so postings have been infrequent. Listen, there are a couple of good events in the Rez area coming up. Taste of Flowood is tomorrow evening at Mirror Lake at 2829 Lakeland Drive. Children 10 and under are free. Adult tickets appear to be $25 a person. Must be something more than Snobiz. Party starts at 5:30 p.m. and lasts until 8 p.m.
Keep the Rez Beautiful's Project Rezway, their big fundraiser, is tomorrow evening at the Craft Center. Bassmaster Classic is this weekend at the Rez. The Outdoor Expo is at Old Trace Park this weekend, too. Godfather Cigar's 6th annual Crawfish Boil, Perdormo and Harley Bike Show is this Saturday, beginning at 2 p.m. $20 all you can eat. Three new kayak-dedicated launches have been installed and are open to the public giving paddlers access to more of the 33,000-acre Barnett Reservoir, the Pearl River Valley Water Supply District announced this week. The new facilities are located at Ratliffs Ferry on the upper river, Brown’s Landing on the north end of the main lake just off the Natchez Trace at Mississippi Highway 43, and at Pelahatchie Shore Park in Pelahatchie Bay. They join the two-year-old kayak launch at Turtle Point in Pelahatchie Bay. The sites include self-launch systems that are consistent with requirements of the Americans with Disabilities Act. The launches allow users to enter their kayaks and slide into the water at the beginning of the trip and an easy paddle up at the conclusion. Handrails are included. All of the new sites are located adjacent to large parking areas. While most kayakers on Barnett Reservoir do so for exercise and pleasure, fishing from kayaks is gaining in popularity. The lightweight craft can navigate more shallow water that bigger boats simply can’t reach. While it’s true kayaks can be launched basically anywhere, including existing boat ramps, it’s good to have decided sites. When 110 of the top bass anglers in the world hit the 33,000-acre Barnett Reservoir April 27-30 for the Academy Sports + Outdoors Bassmaster Elite Series event, they’ll be catching the 52-year-old lake in near peak condition. Ryan Jones, the Mississippi Department of Wildlife, Fisheries, and Parks fisheries biologist whose region includes Barnett, said the reservoir’s bass population is in excellent shape. - Healthy Hustle Color Run at Mississippi College at 8 a.m.
- D1 for Hope 5K at 8 a.m. in Madison. - Rally for Roosevelt at Germantown High School in Gluckstadt at 8 a.m.
- Run for Our Community in Jackson at 8 a.m.
- Walk, Run and Stroll at 9:30 a.m. at the Ronald McDonald House. Mill Creek residents took to the Board of Supervisors meeting yesterday morning, and WAPT was there. WEATHER PERMITTING; KRB will host another Great American Clean Up below the Ross Barnett Reservoir Spillway on Earth Day, Sat. 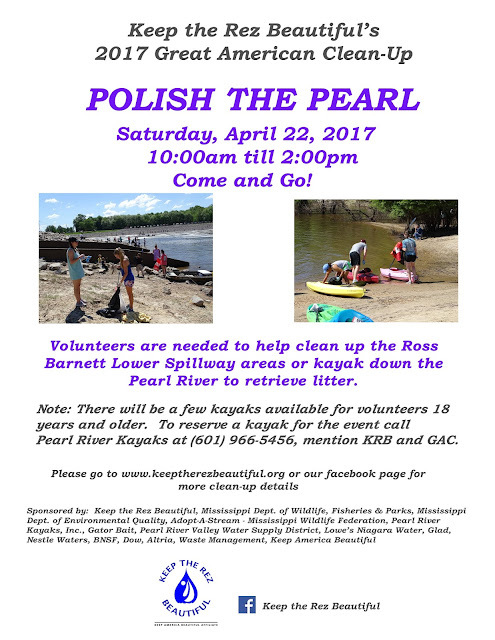 April 22 (on the west side of the river), to help alleviate litter that plagues the Pearl River and the Gulf of Mexico. The heavy rains really flushed tons of litter out of storm drains. 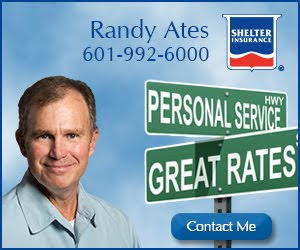 If you would like to reserve a kayak, please contact Angie Webb, Pearl River Kayaks, Inc. at 601 966 5456 and mention KRB. Volunteers are also needed to pick up litter in the parking lots and on the sandbars. Let's Polish the Pearl this Earth Day and leave it shining! Two adults and three juveniles were recently arrested in the City of Madison in connection with a number of Rankin and Madison County auto burglaries. 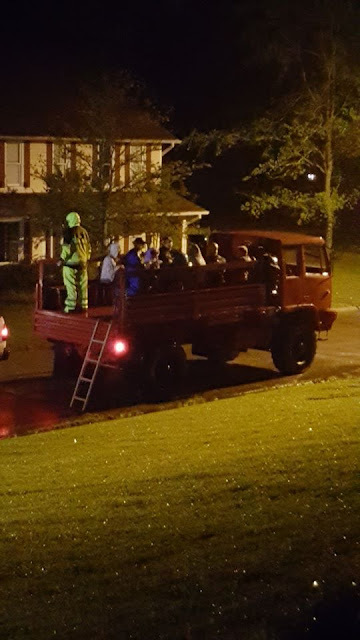 Noah Brian McRae and Austin Payne Bieliauskas, both 18, and both residents of the Rankin County Reservoir area, are the two "adults". The juveniles have not been named. The police recovered several firearms, one was a shotgun stolen from a car in the Reservoir area; two other firearms were stolen from a car in Flowood. I let this sneak up on me. Tonight is Movies-N-Moonlight at Winner's Circle Park. Moana is showing. The movie begins at dusk. Synergy Myofascial is the sponsor. Enjoy this beautiful weather! Lakeside Pres -- Maundy Thursday 7 p.m. -- Easter Sunday 8:30 and 11 a.m.
Pinelake -- Saturday at 6 p.m., Sunday at 6:30, 8, 9:30 and 11 a.m.
Oakdale Baptist -- Easter Sunday at 8:15 and 10:45 a.m.
Fannin Methodist -- 10:30 a.m.
Fannin Baptist -- Good Friday at 7 p.m., Easter Sunday at 9 and 10:30 a.m.
Church at Northshore -- Sunday at 10 a.m.
River of Life Church -- Sunday at 10 a.m.
St. Mark's UMC -- Maundy Thursday at 7 p.m., Good Friday at 7 p.m., Easter Sunday at 8:20 and 10:45 a.m.
Castlewoods Baptist -- Easter Sunday at 10:30 a.m.
Word of Life -- Satuday at 5:30 p.m., Easter Sunday at 8:30, 10, 11:30 a.m. and 1 p.m.
Vineyard Church -- Easter Sunday at 10 a.m.
Lakeland Pres -- Easter Sunday at 8:30 and 10:45 a.m., with an Easter Brunch in between. Liberty Baptist Church -- Easter Sunday at 10:30 a.m.
Flowood Baptist -- Easter Sunday at 10 a.m. If I got anything wrong (or left anyone out), let me know in the comments and I will update. Happy Easter Week, all! 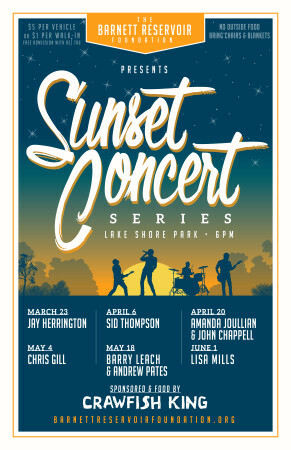 No Sunset Concert Series at the Reservoir tonight. Things kick back up next Thursday, April 20, 2017, with Amanda Joullian and John Chappell. Farmington Station's large neighborhood garage sale is this Saturday (April 8, 2017), beginning at 6 a.m. Enjoy! 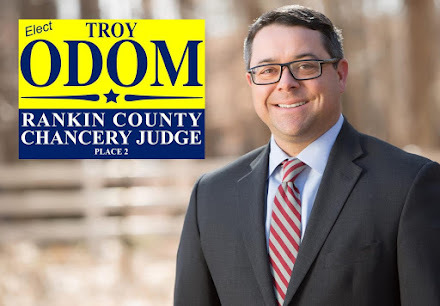 Due to the recent flooding/storms that occurred Sunday night, I will be hosting a town hall meeting tonight at the Reservoir Community Center on Spillway Road at 6:30 PM. I will have representatives from Rankin CountyEmergency Operations, the MS Insurance Department, Rankin CountySheriffs Department, Reservoir FD and our County Road Manager to answer any questions/issues you may be having. I want to provide all of the assistance needed to the residents of District 2 to insure that we can get through this disaster as efficiently as possible. We will discuss issues on debris removal, insurance policy questions, home clean up efforts and the possibility of State assistance. Please help me spread the word about the meeting tonight to our neighbors who have been effected by this storm. Barnett Reservoir lake levels began falling Tuesday night after Pearl River Valley Water Supply District officials got ahead of inflows caused by Sunday rain event throughout the Pearl River Basin, and no further increases in the discharge from the dam is expected. During Wednesday’s 9 a.m. conference call with the National Weather Service Jackson, the Lower Mississippi River Forecast Center in Slidell, the U.S. Army Corps of Engineers in Vicksburg, the U.S. Geological Survey, and the City of Jackson, PRVWSD, it was decided to keep the discharge at 43,000 cubic feet per second for another 24 hours. 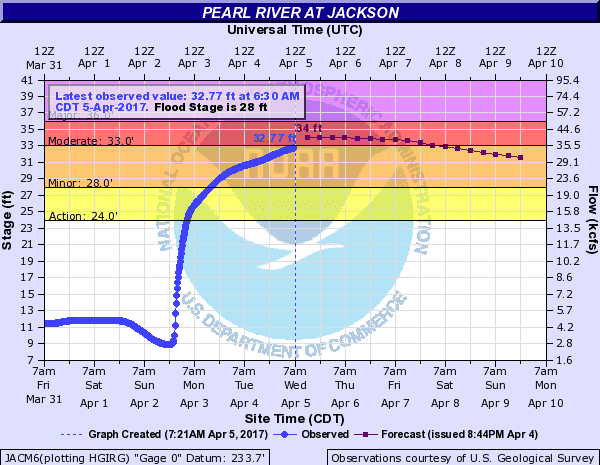 The National Weather Service is still forecasting a crest of between 33.5 and 34 feet on the Pearl River at Jackson for Thursday. 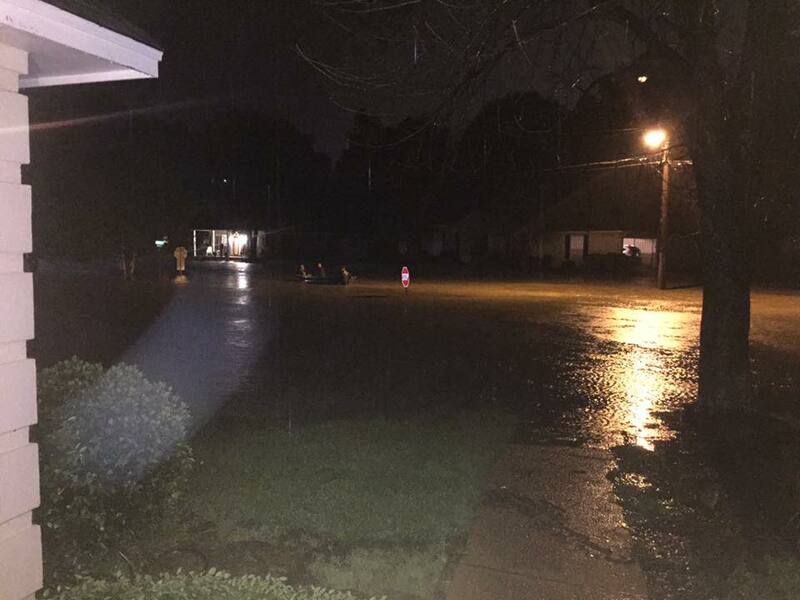 At 34 feet, some minor street flooding will occur in Jackson but water will not threaten homes or businesses. The lake level was 298.4 at 9:15 a.m. Wednesday. 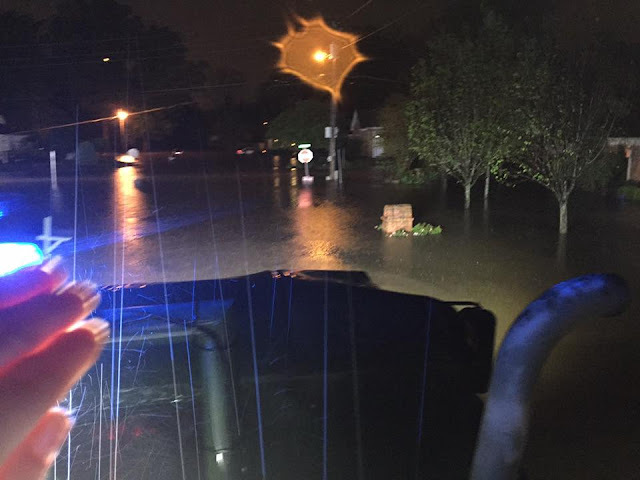 Sigman explained that while the worst of flood threats has passed, high water conditions will continue for two weeks. Inflows into Barnett Reservoir will remain above 30,000 cubic feet per second for at least another 10 days, which means the rate of discharge at the spillway will track at a similar rate. Spillway Road across the dam remains open in both directions, but the access road to the fishing area below the dam on the Madison County side is closed until further notice. The public can track river forecasts online. The U. S. Geological Survey offers real-time looks at river gauges. There are 14 real-time gauges in the watershed above the dam that can be accessed online at https://waterdata.usgs.gov/ms/nwis/current/?type=flow. Below is the info-graphic from the National Weather Service regarding the flood stage of the Pearl River in Jackson, Mississippi. As you can see, that graph was created at 7:21 a.m. today, so we are right below moderate flood stage. We are predicted to reach 34 feet later this morning. Hopefully, the river will peak at no more than 34. The Pearl River last saw these heights in April of 2014. Below is information from the good men and women of the Rez Fire Department concerning upcoming tests on area fire hydrants. Note that you may briefly experience some discoloration in your water. No worries. Pearl River Valley Water Supply District officials increased the discharge at the Barnett Reservoir dam to 40,000 cubic feet per second Tuesday morning in an attempt to slow the rise of the lake after Sunday night’s rain event throughout the Pearl River Basin. The decision to increase the discharge came during a 9 a.m. conference call with the National Weather Service Jackson, the Lower Mississippi River Forecast Center in Slidell, the U.S. Army Corps of Engineers in Vicksburg, the U.S. Geological Survey, and the City of Jackson. During the conference call, the National Weather Service increased its forecasted crest of 34 feet at Jackson at 6 a.m. Wednesday, a foot higher than Monday’s prediction. At 34 feet, some minor street flooding will occur in Jackson but water will not threaten homes or businesses. The increase in discharge was necessary after Monday’s predicted peak inflow into the reservoir was exceeded. The peak inflow is now forecast at 40,000 cubic feet per second at noon on Wednesday. Rankin County EOC Facebook account. Giving you regular updates, like: "School bus routes will begin at 9 a.m. today", safehouse locations, and closed streets. Their Twitter account is here, but it contains no additional info. The Rankin County School District states: Due to flooding across the county, the Rankin County School District will have a delayed start in ALL schools. Elementary schools will begin at 10 am and middle schools and high schools will begin at 10:30am. Bus routes will begin at 9am. The RCSD Facebook page is here. WAPT Coverage is found here. One woman died after her car was swept into a creek down in Florence.